Let's get something straight from the beginning. Humans are spewing carbon dioxide into the air and, while there are a number of sinks that will take up much of it, it takes time and much of what will eventually end up in a sink will spend significant time in the atmosphere first. This increase in atmospheric carbon dioxide will generally contribute to a higher mean global temperature. If you are inclined to deny these two assertions, you are, indeed, an unscientific, head-in-the-sand, Climate Change Denier. However, there is an enormous gulf between CCD's and the-sky-is-falling, apocalyptic prognostications of the Climate Change Industry. Somewhere in that gulf is the most probable scenario. Precisely where that point is constitutes one of the most, if not the most important question, facing us today. That is not because we need to avert the apocalypse but rather because we are very likely to impose upon ourselves a cure that is far worse than the disease. The Climate Change Industry is an unholy alliance between the climate science community and a small, but highly influential, community of socialists and globalists. Scientists outside of the climatology specialties are mildly liberal and vaguely globalists. Consequently, in addition to the 'science team loyalty', they generally look favorably upon any arguments made from the perspective of taking global action for the betterment of Mankind. I really don't blame the climate scientists. Well, not much, anyway. It is an ineluctable truth that governments fund research proportional to the perceived severity of the problem and industry funds research proportional to the perceived opportunity. Since climatology just isn't likely to get much industry research funding, it is in the best interest of climatologists, within the constraints of scientific integrity, to emphasize the potential dangers of climate change. Actually, the problem isn't so much with the scientists as it is with the news media that interprets the science. 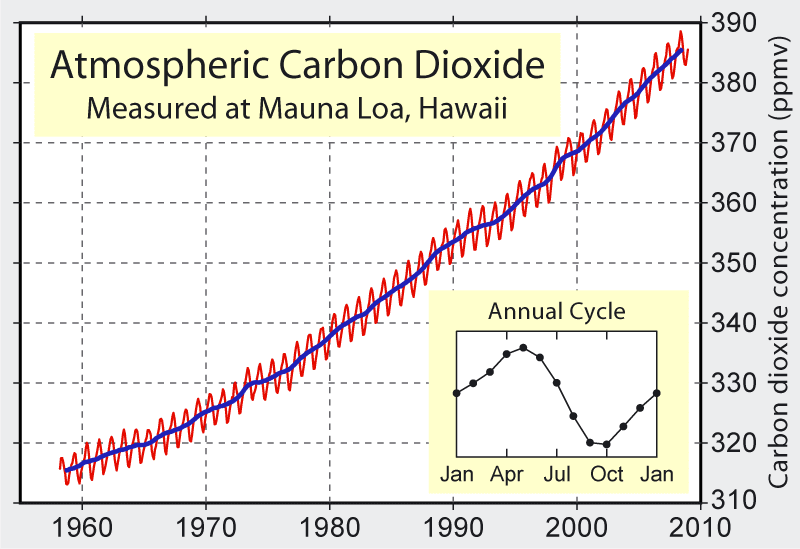 For example, the atmospheric CO2 has been increasing at the rate of .5% per year for quite some time. The latest reported concentration was 397 ppm. So, the naive projection would result in 397*1.005^87 = 613 ppm at century end. The IPCC AR5 midrange is 650, not significantly different than the naive projection. This level of increase suggests a temperature increase of about 1.5°C by 2100. This value falls within the margin of error of all IPCC AR5 scenarios. It is also not very alarming either in itself or in its implications. "On our current emissions path, CO2 levels in 2100 will hit levels last seen when the Earth was 29°F (16°C) hotter"
A factual report on the IPCC AR5 midrange projections. Essentially, based upon current Climate Sensitivity analysis the AR5 slightly over estimates temperature increases, but keeps the result consistent with a 3.0°C CS value within their margin of error. Taking the highest range and, in some cases finding reasons to go even higher than that, the media significantly misrepresents the science. 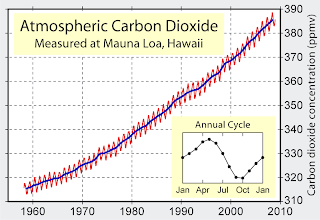 As we can see with the graph to the left, we have a consistent CO2 record for more than 50 years that just doesn't deviate very much from the .5% per year increase in CO2. The Climate Sensitivity number has been found to be 3.0°C +/- 1.5°C for quite some time and more recent research suggests, if anything, it may be in the lower half of this range. So, there really isn't much reason to expect a midrange to be much different than 1.5°C implied by the naive projection. At least unless there is a substantial change in the amount of CO2 emissions. Again, a full treatment of the science behind climate change would be very extensive and is not my point here. Rather I wish to show that the climate science community, knowing on which side their funding bread is buttered, has a mild bias toward the upper range of reasonable projections. However, the media and politicians with a political agenda strongly biases their projections to the upper end, often arguing for scenarios that exceed the margin of error of the highest projections. The more serious problem, however, is the use of the apocalyptic scenarios based upon the upper end and beyond projections. Sadly, the research is generally only done on the deleterious effects of warmer temperatures. For example, earlier research suggested that climate change would result in a decrease in the food producing capacity of the planet. It has now been replaced by research that concludes that the amount of arable land will increase sufficiently to feed an additional billion people. Clearly, average yield per hectare will increase due to longer average growing seasons, but, while it has been sporadically mentioned, no research results have been reported. Despite this the news is still full of starvation scenarios based upon extended droughts and lower yields per hectare. The Sahel is greening and global warming is consistently credited. In fact, some research suggests that the Sahara desert may be gone completely within a century. However, this rarely gets reported. There was a flurry of reports when the 2009 research was published, but it is not mentioned anymore. This is potentially an increase arable land equal to the U.S.
At the beginning of the Global Climate Change phenomenon it was regularly reported that rising temperatures would increase the frequency and severity of weather events. However, over time, it was discovered that the number of severe tornadoes and hurricanes have actually been decreasing. We are aware that the decrease in severe hurricanes is probably the result of increases in high altitude wind sheer. The decrease in tornadoes may be due to reporting bias. However, there are emerging explanations for a decrease in the severity of landbased storms, as well. Again, this is rarely reported. It is true that rising ocean levels will almost surely decrease the amount of shorelines and ocean front property is particularly desirable. However, the warming planet will increase the total desirability of ocean front land, because warm beaches are preferred to cooler ones. Total land suitable for human communities, by moving tropical, subtropical and temperate zones poleward, will also increase. I suspect, but do not know, that global warming will not have significant impact on human activities and, after an initial period of transition, will be mildly positive from a human perspective. I can't make a confident statement because the research needed to have a balanced position is not being funded. While global warming will displace species, it is not yet clear exactly what the relationship will be between a warmer planet and biodiversity. We know that, generally, stable ecosystems decrease diversity while perturbed ones often provide opportunities for speciation. Also, much of the climate induced threat to species is exaggerated. For example, polar bears were put on the endangered species list in 2008, citing global warming. However, on further review, it appears that polar bear populatons may actually be increasing. It is also questionable that global carbon emissions will remain at present levels or increase. 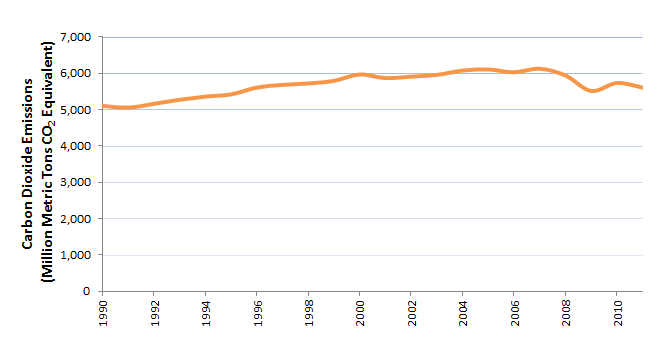 Total carbon emissions in the U.S. after remaining relatively flat beginning in 2000 began falling in 2007 and will likely continue to do so. There are currently 4,800 MW of installed solar plants. However, that is about to explode with 27,000 MW of capacity either under construction or planned. This will reduce U.S. carbon emissions by about 1/2 % alone and we are far from done. This burgeoning use of solar energy to equalize the demand curve is simply not being reported. As reporters say, 'It doesn't advance the narrative.' This is a horrible journalistic practice but widespread. By this statement,they mean that the story is that humans are polluting the environment with their rapacious appetite for energy and if they don't take drastic action there will be Hell to pay. The rapid transition from hydrocarbons to solar energy for much of the peak shaving electricity requirements, for example, will just confuse the audience and detract from the true story. Enhanced Geothermal Systems, Ocean Thermal Energy Conversion and Liquid Fluoride Thorium Reactors can meet all of our energy needs at current prices. Electric cars, getting their energy from the roads, will provide a realistic way to wean our transportation energy use off of oil. 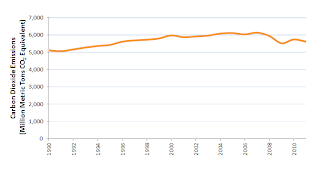 What this all means is that by 2050 carbon emissions likely will be falling precipitously. This will result in CO2 atmospheric concentrations being less than even the IPCC AR5 lowest scenario. It means that by 2100 atmospheric CO2 and global temperatures may be lower than today. This will likely happen even without any draconian global treaties which are useless if they exempt India and China, as the Kyoto treaty did. As we can see, the U.S. emissions are decreasing and Chinese emissions have increased so dramatically that they now surpass the U.S. as the top CO2 emitting nation. India is now fourth behind Russia. So, the evidence for dramatic anthropogenic global climate change and projected deleterious effects from it is not as strong as is presented in the press. However, it is non-trivial, either. So, as Acting Editor of The Polymath I will institute a regular column that will present evidence for and against the risk from Anthropogenic Global Climate Change. I will not allow rabid deniers or alarmists. The idea that you can present hysterical or extreme views and the reader will average them and come up with a considered position is false. It becomes my lies against your lies and the truth is nowhere to be found. However, there is a range of perspectives that should be considered by the erudite person. I will strive to have them presented them honestly and responsibly. Please subscribe to The Polymath if you have not already done so. It will be sporadically published until we have grown sufficiently in circulation to support ourselves as a weekly news magazine.